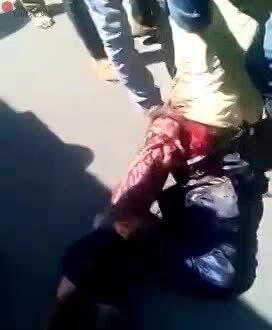 Nasty road accidents leaves a man with his legs and groin shredded into bloody bits. Luckily for him, some bystanders who witnessed the accident help him. They carry him down the road and into some sort of taxi vehicle to take him to get medical attention. Anyone else want to see someone take a handful of salt and rub it up and down that leg, or am I just feeling extra sadistic tonight? guy's face gets swollen literally like a balloon after accident.